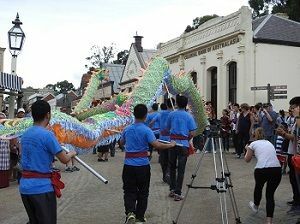 The Society was formed in October 2008 in recognition of the changing needs of the Chinese community in Ballarat. In that time the Society has quickly developed strong relationships with the City of Ballarat, Sovereign Hill and Mt Clear College. There are over 200 members in the Society with 85% being either Chinese or of Chinese descent with the remainder being Australian. 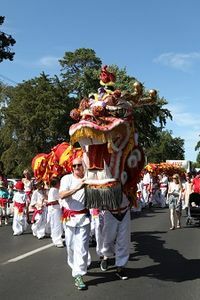 Several are fourth-generation descendants of Chinese migrants to Ballarat in the 1800s while many have only recently come to Ballarat from overseas. President Michelle Philips is the first non-Chinese president of the association and is also the first female president. Michelle firmly believes that the society is blessed with both its friends and supporters as we all work towards bridging the cultural gap. At last count, members come from eight different countries and speak at least 12 different languages. The Society conducts weekly Chinese language lessons and strongly supports the Mt Clear Confucius Classroom. 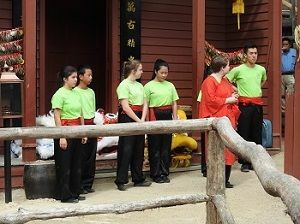 Training is also available in Tai Chi, Chinese folk dancing and Chinese Lion dancing. The Society will be holding a Sticky Rice "Come & Try" Lunch at the VRI Hall 235 Lydiard St, Nth Ballarat on Sunday 17th June 12 PM. Everyone is asked to bring food to share, s specialty/favourite from your childhood or province. Fried rice, noodles & tea will be provided. 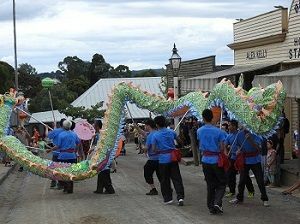 Cost $5 per person for members, $10 per person non-members to assist with payment of hall hire etc. 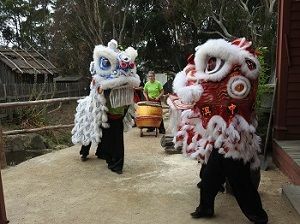 A great opportunity to make new friends and try amazing home cooked meals from all over China & Australia. 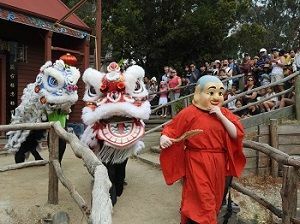 To assist with catering please contact Charles Zhang 0422 343 357 if you wish to come along. Hopefully, all our members and friends enjoyed a peaceful break with friends and family for Christmas and the Aussie New Year. 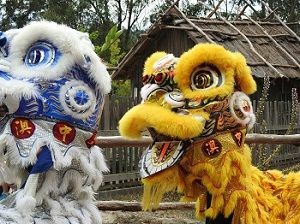 February 16th marks the beginning of the Year of the Dog. This year also sees us celebrate our 10th anniversary in October so get ready for some serious celebrating. 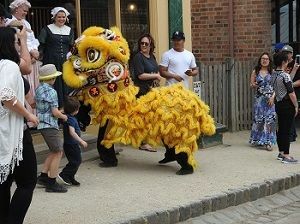 Sunday, February 18th the Society will begin our regular annual events starting with the community celebrations at Sovereign Hill along with Chinese themed activities, a street parade featuring our Lions and Dragon and performances by our Happy Birds dancers. After the celebration at the Joss House, there is an opportunity to get together at the kiosk. Please bring some food along to share on the day that can be eaten with your fingers. 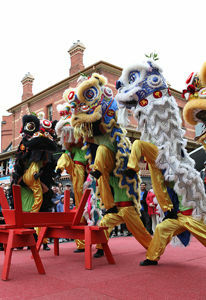 The Society will arrange for a whole roast pig as usual, a delicious highlight of Chinese New Year. All paid members of the Society will be admitted free of charge to Sovereign Hill on this day provided you show your current membership card to entry staff. Cards have been posted but may take a week to arrive in your letterbox so keep an eye out and don’t lose your card when it arrives. Friends and family are welcome to attend but will be required to pay ½ price entry fee. This is very good value. Of course, being a member is even better. 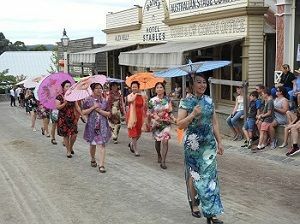 This exhibition is a major Australian exhibition exploring stories of early Chinese Australians. Read and observe how, with organisation and sophistication, an incredible spirit of determination along with an ability to integrate into Western society, pioneering Chinese not only survived but actually came to prosper. See how Chinese brought their skills (growing vegetables, business enterprises to mention but a few) to a colony, how their culture enhanced our "young" country and see for yourselves the indignations and racial bias that they had to endure. THIS EXHIBITION IS A MUST SEE!! Click below to go to the M.A.D.E. site (Museum of Australian Democracy) that is hosting this exhibition.